Recently I’ve been experimenting with different sized brushes. Trying to reduce my dependence on very small brushes to paint details in landscapes. Its a good exercise for a beginner, as you probably know if you remember your first paintings. Many a fine painting went into a spiral of ‘fiddly’ details never to be completed. I remember it well – could I ever forget? I’ve decided that for my style of painting I need to ‘add touches’ with a fine brush. I actually got agitated when I finished a painting without ‘the touches’. I won’t go back and finish them off. I’ll leave them as a reminder of that particular phase. Another restriction of the ‘large brushes only’ syndrome is placing figures in a landscape. Its messy. A well placed stroke with a fine brush can not only add a figure but add movement or gesture as well. I’ve been practising figure painting lately with a view to painting more ‘figures in a landscape’ type paintings. I actually prefer the loneliness of deserted places and these are frequent subjects for my paintings. But its time for a change. Going back to basics is the best approach. Read all the books, look at all the videos and then start from scratch. Its amazing the variety of methods used by different artists. Take a little from them all and discover your comfort zone. 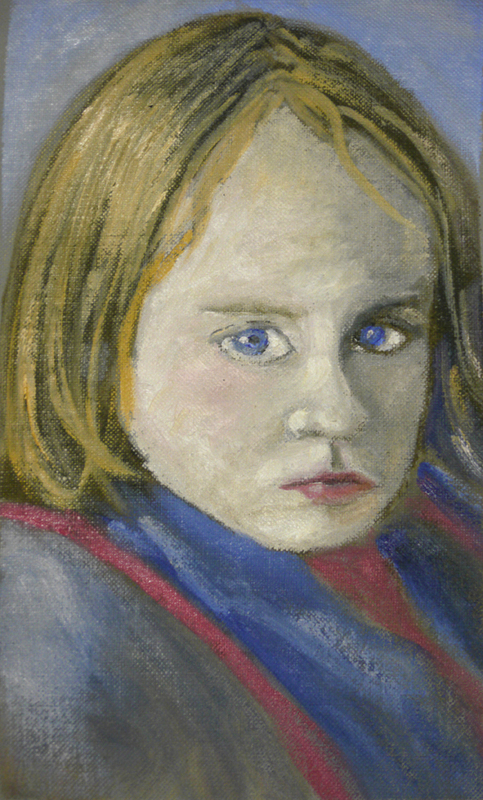 This picture is painted from a photograph of one of my grandchildren. I obviously know the particular child in the photo but I can’t decide which of the children it looks most like. I’ve got the ‘family resemblance’ but not the personal likeness. At least I’m making progress. I hope to break the process down into simple steps and add my particular method to the multitude already out there. I’ve already discovered a few essentials which were not mentioned in the material I’ve viewed. For example, the shape of the head (or silhouette) is essential, also, the precise shape of the eyes and the position on the head determines the likeness. This is where the fine brushes are required. but more anon. Buy the way, I’ve added a new page with most of the paintings discussed in these posts. The relative sizes are not correct but its nice to see them all together. This entry was posted in Oil Painting and tagged Art, Culture, Education, Inspiration, Oil Painting Faces, Oil Painting Figures, Painting a likeness. Bookmark the permalink. Thank you for your comment. You’re right, but the most difficult part for me is my lack of interest in painting portraits. Sometimes I think the art of photography does a better job at capturing the personality of the person in a picture.